Scott Young and Danny Gabbidon claimed their first win as Cardiff City's joint caretaker managers with victory over Sheffield Wednesday. With prospective new boss Russell Slade watching from the stands, Cardiff took the lead through Sean Morrison's firm first-half header. Morrison then scored an own goal after the restart to pull Wednesday level. 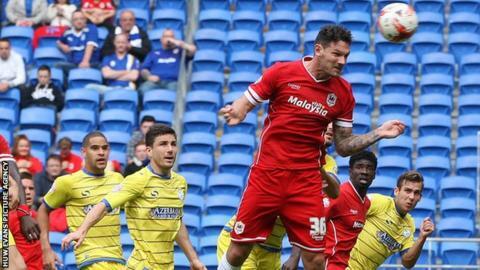 But Anthony Pilkington's sharp volley secured Cardiff's first league win since August 19. Victory came as a huge relief for the hosts, whose recent poor form had led to Ole Gunnar Solskjaer's departure as manager. The Bluebirds are still in negotiations with Leyton Orient about the appointment of Slade, who resigned from his post at Brisbane Road on Wednesday. Young and Gabbidon have been placed in temporary charge while Cardiff wait to finalise a deal for Slade. This was their third match in charge and, after a dismal 3-0 defeat to Bournemouth in the Capital One Cup on Tuesday, it was no surprise to see them make nine changes for the Owls' visit. Wednesday had also been beaten heavily in midweek - 7-0 to Manchester City - but with that loss coming against the Premier League champions, Stuart Gray made only four changes to his side. That was largely because Wednesday's league form had been markedly better than Cardiff's. With no wins in five Championship games, the Bluebirds had slipped to 16th in the table. Sheffield Wednesday, by contrast, entered this match in the play-off places after two successive Championship victories. They seemed buoyed by their recent good form as they made a bright start, Stevie May rounding Cardiff goalkeeper David Marshall inside six minutes but having his shot cleared off the line by Fabio Da Silva. It was not until 20 minutes later that Cardiff managed their first effort, as Aron Gunnarsson's header was well saved by a stretching Keiren Westwood before Kenwyne Jones volleyed his rebound over. Westwood was powerless, however, to prevent Cardiff's opening goal. Peter Whittingham curled in an inviting free-kick and Morrison sent a powerful header into the net. Morrison's first goal in a Cardiff shirt came just six minutes before half time. His second came three minutes after the restart - but for the wrong team. Wednesday's Chris Maguire fizzed in a low cross from the right, prompting Morrison to slide in and inadvertently prod the ball beyond Marshall in the Bluebirds' goal. The Owls' equaliser prompted a period of intense Cardiff pressure. The hosts regained the lead shortly after the hour, as Jones nodded down to Pilkington, who juggled the ball deftly and volleyed in from 12 yards. Cardiff substitute Federico Macheda had an injury-time goal ruled out for offside but, after a nervy last few minutes, Young and Gabbidon were merely thankful to hold on for a precious victory. Cardiff City joint caretaker manager Scott Young: "If it was our last game then it's not a bad record really. We are unbeaten in the league, and we have taken four points out of six. "We will have conversations over the weekend with the owner and the chairman and see where we go from here. "We all know winning breeds confidence and hopefully this result can do that for the squad. We have taken a point at Derby and we have won at home here, now it is important we get a result at Brighton because that will keep the confidence building." Sheffield Wednesday manager Stuart Gray: "I thought if we had got our noses in front we would have won here as they would have been a bit nervous at home. "I thought once we went to 1-1 there was only one team that was going to win it, but it shows that if you do not defend your 18-yard box properly you are going to concede. We have tended to do things right in both boxes and we did not do much right in either." Match ends, Cardiff City 2, Sheffield Wednesday 1. Second Half ends, Cardiff City 2, Sheffield Wednesday 1. Offside, Cardiff City. Ravel Morrison tries a through ball, but Federico Macheda is caught offside. Stevie May (Sheffield Wednesday) wins a free kick in the attacking half. Attempt missed. Ravel Morrison (Cardiff City) right footed shot from the left side of the box is close, but misses to the left. Assisted by Mats Daehli. Attempt missed. Royston Drenthe (Sheffield Wednesday) left footed shot from more than 35 yards misses to the right. Assisted by Liam Palmer. Attempt blocked. Anthony Pilkington (Cardiff City) left footed shot from the centre of the box is blocked. Assisted by Ravel Morrison. Foul by Lewis Buxton (Sheffield Wednesday). Federico Macheda (Cardiff City) wins a free kick in the defensive half. Attempt blocked. Royston Drenthe (Sheffield Wednesday) left footed shot from outside the box is blocked. Assisted by Gary Madine. Substitution, Cardiff City. Joe Ralls replaces Fabio because of an injury. Glenn Loovens (Sheffield Wednesday) is shown the yellow card for a bad foul. Ravel Morrison (Cardiff City) wins a free kick in the defensive half. Offside, Sheffield Wednesday. Atdhe Nuhiu tries a through ball, but Gary Madine is caught offside. Offside, Cardiff City. Anthony Pilkington tries a through ball, but Aron Gunnarsson is caught offside. Corner, Cardiff City. Conceded by Lewis Buxton. Jacques Maghoma (Sheffield Wednesday) wins a free kick in the defensive half. Foul by Federico Macheda (Cardiff City). Substitution, Sheffield Wednesday. Gary Madine replaces Josè Semedo. Offside, Cardiff City. John Brayford tries a through ball, but Anthony Pilkington is caught offside. Stevie May (Sheffield Wednesday) wins a free kick in the defensive half. Attempt missed. Bruno Ecuele Manga (Cardiff City) right footed shot from outside the box misses to the left. Assisted by Peter Whittingham. Ravel Morrison (Cardiff City) wins a free kick on the left wing. Attempt blocked. Atdhe Nuhiu (Sheffield Wednesday) left footed shot from outside the box is blocked. Assisted by Glenn Loovens with a headed pass. Royston Drenthe (Sheffield Wednesday) wins a free kick on the right wing. Substitution, Sheffield Wednesday. Royston Drenthe replaces Giles Coke. Substitution, Sheffield Wednesday. Hallam Hope replaces Chris Maguire. Substitution, Cardiff City. Federico Macheda replaces Kenwyne Jones because of an injury.